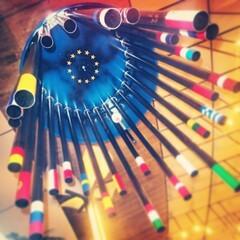 Instapic: the EU flag statue inside the European Parliament. What many people in the UK don’t realise is the extent to which the UK has held back the EU. When I still lived in Denmark, I was an active member of my party’s EU politics committee, and when we discussed with people from Brussels why the EU didn’t do this or that, very often the answer was that London had vetoed it. Of course other countries sometimes insisted on things too, such as France’s insistence on keeping the European Parliament in Strasbourg, or Greece’s veto on accepting relations with Macedonia under that name, but Westminster politicians got their way in many and varied ways. It’s instructive to note that even before Brexit takes place, the other countries are already starting to think about the prospects of creating an EU army (and if it’s something Germany can live with, I don’t think it’s going to be a bad thing). Schengen started out separate from the EU. Why was that? Because the UK vetoed it, of course. And today only the UK and Ireland want to remain outside it – the other non-members (Bulgaria, Croatia, Cyprus, and Romania) want to join as soon as possible, I believe. So once the UK leaves, what will happen to Schengen? In the short term, nothing much. But in the slightly longer term, there will be a desire to create an equivalence between the EU and Schengen (so that, for instance, one can talk about an EU visa rather than a Schengen one). Allowing for a few extra countries such as Norway or Iceland shouldn’t be a problem – they’re practically EU members without a vote anyway. The problem will be Ireland. I predict that Ireland will come under pressure to abandon the Common Travel Area with the UK and join Schengen instead. It will have many advantages for Ireland, too, and to be honest I think their only real concern will be Northern Ireland. The Euro is yet another part of the EU that might get integrated better with the rest of the union over time. Apart from the UK, only Denmark has a formal opt-out, so once the UK leaves, it will be tempting to start merging the normal policy-making forums with the parallel ones controlling the Eurozone. Wouldn’t it be interesting if the EU suddenly starts functioning much better without the UK? And imagine if the UK regrets Brexit after a few years and suddenly has to join Schengen, the Euro and other projects Westminster fought tooth and nail for decades?